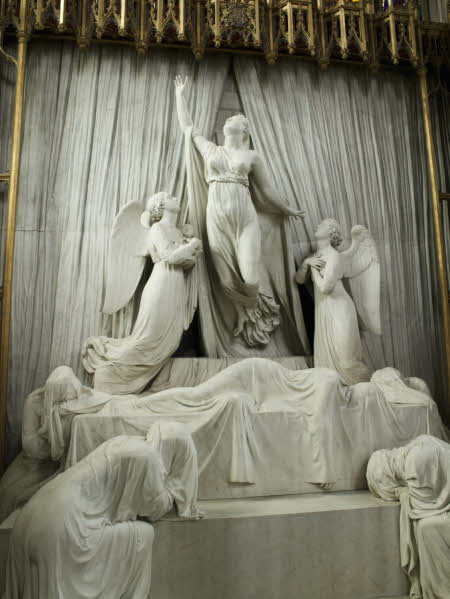 The memorial to Princess Charlotte, the only child of King George IV, will feature in a BBC programme on Regency Art. The three-part series, presented by Dr Lucy Worsley, begins on Monday 29 August on BBC4. Princess Charlotte is buried in the Royal Vault of St George’s Chapel but the exquisite memorial to her and her child can be seen in the Urswick Chantry in the north west corner of the Chapel. Matthew Wyatt was the sculptor for the monument which was paid for by public subscription limited to a shilling per person. Above a shrouded body Princess Charlotte ascends from the tomb accompanied by two angels one carrying the child. Had Princess Charlotte lived beyond her 19 years she would have become Queen after the death of her father, King George IV. The boss featured in one of the two main photographs on the homepage of this website shows George IV’s cypher (GIVR) and is located directly above the memorial. For more information about this period in St George’s history please click here. For more information about Royal burials at St George’s please click here.